Do you have a homeschool student? Join us at Homeschool Hangout where you can socialize and have fun while learning. Homeschool Hangout is a place for stories, crafts, learning games and STEM programming. We will touch on everything from History to Art, English, Science, Geography and even entrepreneurship. You will also learn about a myriad of valuable library databases and resources. The format/curriculum will vary each session and will include but not be limited to videos and/or short formal lessons. 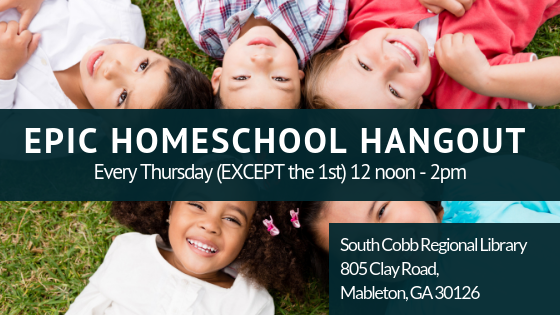 This program is co sponsored with the South Cobb Regional Library All homeschooling families are welcome to attend.